One of the most anticipated 3DS games scheduled for release this year is Fire Emblem Fates, the latest in the Fire Emblem franchise. The title is set to be released near the end of February and I’d like to take this opportunity to add to the game’s buzz by talking about the Fire Emblem franchise in general, as well as share some of the innovations that were introduced in Fire Emblem Awakening (the previous entry in the franchise). Fire Emblem is one of Nintendo’s strategy RPG franchises, with games released for the IP as early as the 8-bit Famicom era as Japan-only releases. The brand got mainstream exposure when two Fire Emblem protagonists were included in the roster of Nintendo’s 2001 title Super Smash Bro. Melee which must have sparked enough interest because two years later, Fire Emblem on the Game Boy Advance was released in all regions. Since then, all but one of the succeeding Fire Emblem games have been released worldwide. 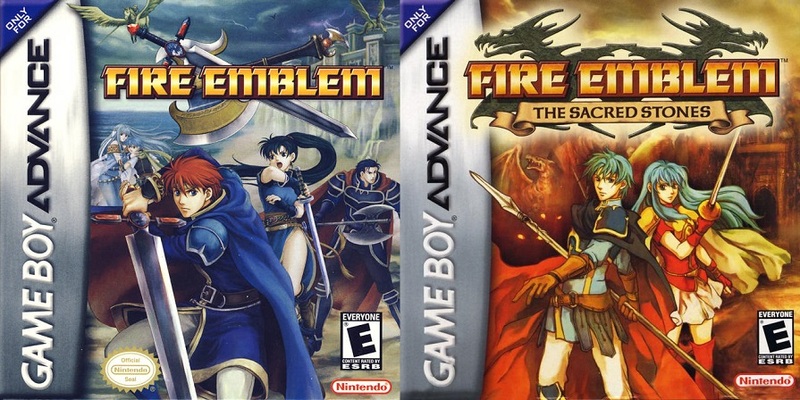 The first Fire Emblem games to be localized for Western audiences were released on the Game Boy Advance. Fire Emblem games almost always follow a high fantasy medieval setting, filled with kingdoms, knights, mercenaries, and so on. Units in Fire Emblem are unique, named characters, each with their own individual characteristics such as stat growths, class restrictions, and so on. They also have their own personalities, fleshed out through Support Conversations – one of Fire Emblem’s signature mechanics. 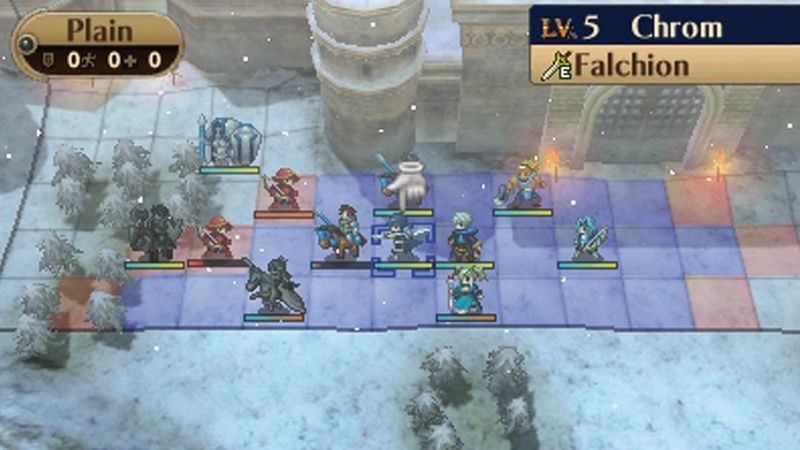 Battles in Fire Emblem play out similarly to most other turn-based strategy RPGs, in maps divided into square grids where you move your units on. 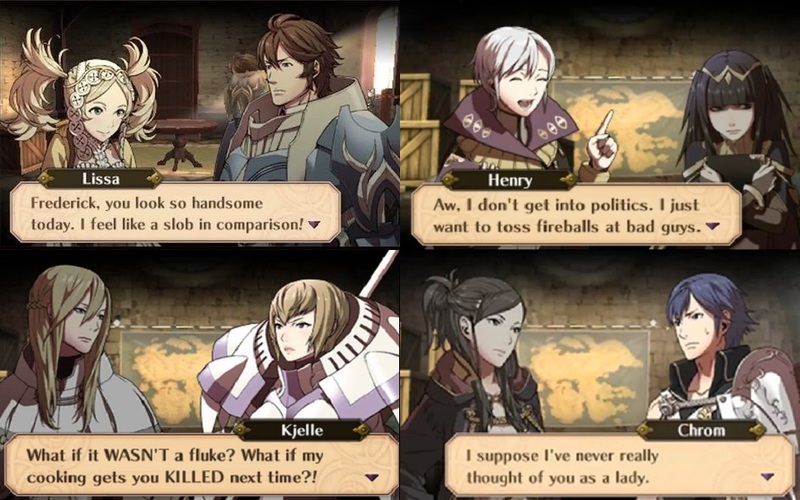 In Fire Emblem, most characters have a designated set of characters that they can have Support Conversations with. When two such characters are adjacent to each other during an attack or while defending, they earn a certain number of what I’d call “Support points”. When you get enough Support points between two characters, their Support rank as a pair goes up and a dialogue between the two can then be triggered. Fire Emblem Awakening has a mode wherein you can revisit every Support Conversation that you’ve unlocked. Flavorwise, these conversations flesh out the personalities of the characters more and give you insights on what their motivations are. However, there are benefits to gameplay as well – characters who achieve certain Support ranks get stat bonuses in battle whenever they are adjacent to each other. This adds to the level of strategy required in Fire Emblem – not only do you need to think about how to achieve victory, but you also need to factor in how you gain and increase these Support Ranks. New to Fire Emblem Awakening is the marriage system. In that game, two characters of different genders can marry if they achieve the highest Support Rank possible (S Rank). Once you have a married couple, you can get to recruit their offspring (no details on how this is explained in the game to avoid spoilers) into your army. The characteristics of these offspring will depend on who their parents are and will inherit the skills of their parents, adding another layer of strategy that you have to consider. Because of the Support Conversations, characters in most Fire Emblem games (especially Fire Emblem Awakening because of the marriage system) are so well-developed that it’s easy to get emotionally attached to them. Which makes another signature mechanic of Fire Emblem quite significant: Permanent Death. Fire Emblem games are known for being difficult and it’s usually because of this Permanent Death or Permadeath (as Fire Emblem fans have coined) feature. While turning off some people from the franchise, I actually like this feature as it means you really need to have good strategy in order to win and keep your entire roster intact, even if it means needing to reset the game every so often. And because of the emotional attachment created by good character development, each death in Fire Emblem games really feel like you’re losing someone important. Thankfully, Fire Emblem Awakening and the upcoming Fire Emblem Fates games have a Casual Mode that has Permadeath disabled, making it more accessible to people who are playing mainly to experience the game’s storyline and not for the challenging gameplay. As far as the actual gameplay, Fire Emblem games follow the basic turn-based combat mechanics found in RPGs. Characters have specific classes which have different skills and abilities – knights are melee attackers while archers are ranged combat specialists, for example. Another signature of Fire Emblem games that make them stand out from the rest is the weapon triangle system wherein melee attackers can use three different weapon types: swords, lances, and axes. Similar to rock-paper-scissors, in Fire Emblem games, swords beat axes, axes beat lances, and lances beat swords. Because of the different gameplay mechanics in Fire Emblem games, proper positioning is very important in successfully completing missions. This allows for even more varieties of character classes – a mercenary for instance, can only wield swords, while a knight can wield swords and lances, and a fighter can wield axes. All three are close combat attackers but because of the weapon types that they can use, players will really have to think of good strategies that will make effective use of their characters. In later Fire Emblem games, certain units gain the ability to Carry other units, allowing for even more strategic options. For instance, a slow moving unit such as a heavily armored knight can be carried by a fast moving unit such as a cavalier, allowing the knight to move farther than it could on its own. A unit with low defense such as a mage can be carried by a knight, which protects the mage from attacks. In Fire Emblem Awakening, a new mechanic called the Dual System makes use of this carry ability. Instead of a unit simply being carried by another unit, the two units pair up as one. The Dual System mechanic then allows for Paired units or adjacent units to team up in battles – there’s a chance that the second unit can do an follow up attack (called a Dual Strike) or to defend the primary unit from an attack (called a Dual Guard). So aside from gaining Support Ranks, players really have to think about how they position their characters to get the most out of these mechanics. To avoid turning this into a review of Fire Emblem Awakening or a preview of the Fire Emblem Fates games, I’ll stop here. Fire Emblem games cover all the basic features found in other strategy RPGs but all its signature mechanics, from older ones like Support Conversations and permanent death, to newer onces like the Dual System and marriage system, makes Fire Emblem games stand out from all the rest. If you enjoy playing strategy RPGs but have yet to play any of the Fire Emblem games, then you’re missing out. Have you played any of the previous Fire Emblem games? What do you think about the brand as a whole? Share your thoughts by leaving a comment or two below! Which fates are you going to choose? Birthright or conquest? Thanks for the comment! For me, there’s no question – I’m getting the Special Edition if I can. If not, I’ll have to get both and Revelation too.